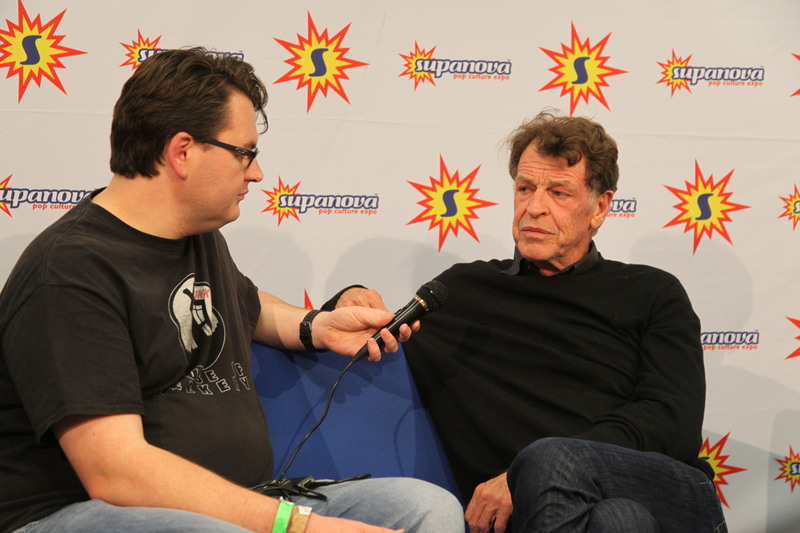 Exclusive Interview with John Noble! We’ve been lucky enough to chat with some cool people this past week, including Brian Krause, James Marsters, Brianna Hildebrand, Stefan Kapičić and Tom Taylor. 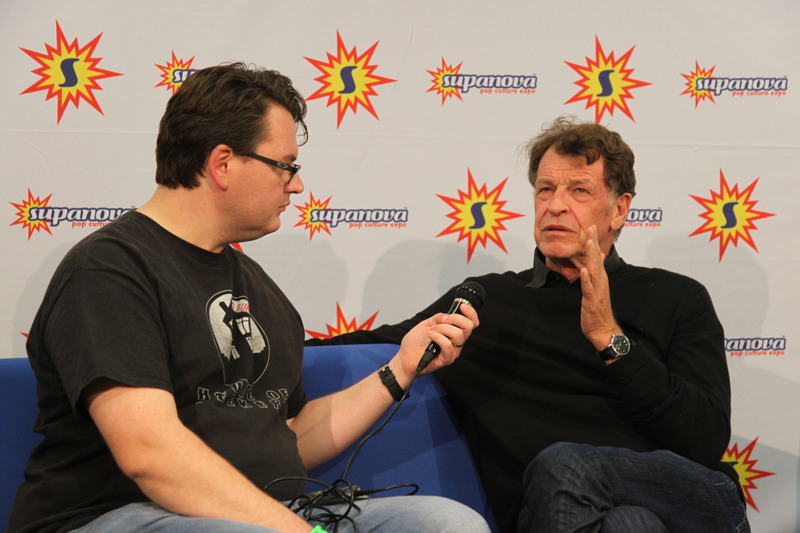 We certainly haven’t left the worst for last though…our final Supanova interview is with John Noble, star of Fringe with appearances in Lord of the Rings, 24, Elementary, Sleepy Hollow and endless others! Best go with the audio on this one, he’s a loquacious fellow! 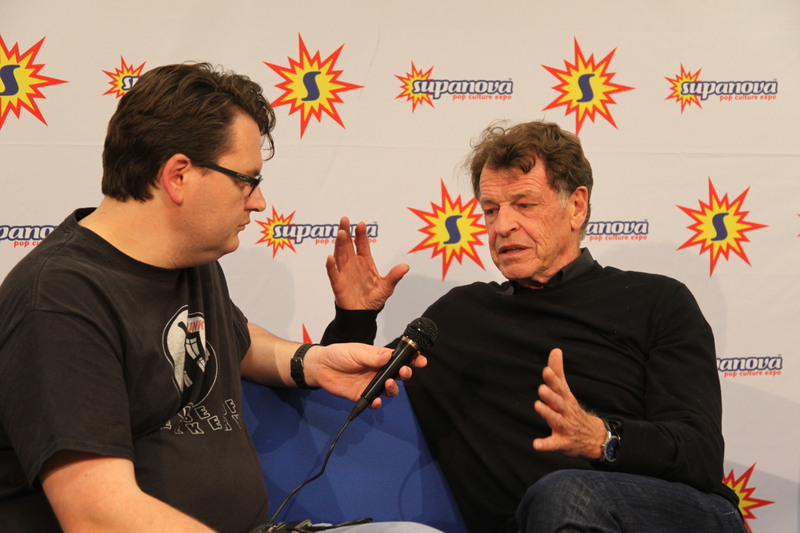 We should also mention that John Noble is such a cool guy that after the interview he pranked called my sister-in-law pretending to be Walter from Fringe. What a legend! 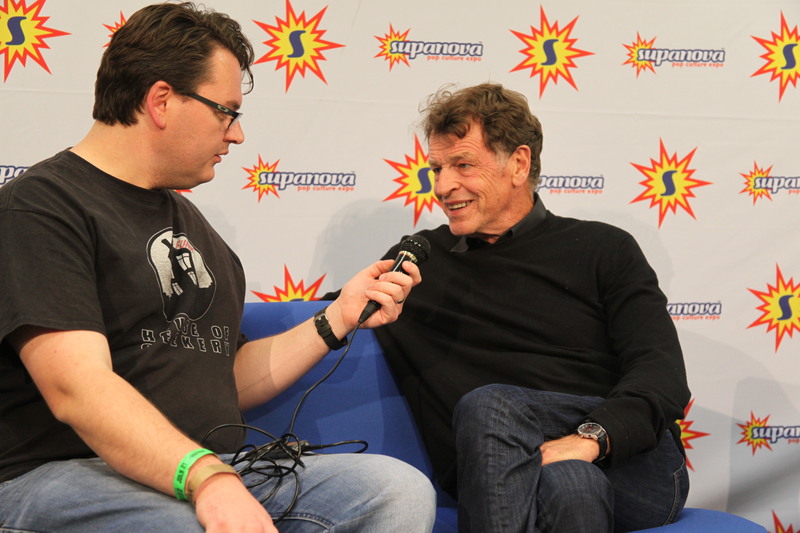 G-Funk: We’re at Supanova Perth, it’s 2016, and we’re talking to John Noble. Hello, sir! JN: I’d been sitting on the other side, so I’m just not sure. I’ll try. I’ll be good. GF: You think you can do it? GF: Think of it as the alternate universe. JN: I needed that! Now I’ve got it. I’m fine. I’m really confident now. GF: Let’s start with Fringe. It had those really strong themes of parallel universes and alternate histories. Did you ever get confused while making it. JN: No, not really. That theme, which kind of seemed kinda strange and fresh, I’d been thinking about all the time and always had. I do study science so I was conscious of the potentials that do exist scientifically and have since been supported entirely. No, I was never confused. In the case of my character, the sliding doors situation, at one point in his life it took him in one direction and me in another, when he was a young man. So I would go back to that point in my mind. The basic character was the same, he just went through different doors. So I understood it. GF: Did you ever have a moment when you weren’t sure which Walter you had to play that day? JN: Ah, well, more confusing for me were the subtle changes in Walter himself. There’s something like 14 or 17 different subtle changes depending on things that happened to Walter at given times. The one I remember best but was the hardest was, I think at the beginning of season 4, when Walter had to function as though there was no Peter in his life. That was really difficult because that was the reason Walter was there in the first place and the reason he functioned as he did and that was really challenging. So I wondered ‘what the hell am I going to do?’, so I made him a bit OCDC and a bit miserable. With the OCDC there are certain mannerisms you have to follow and I’d say to cameraman, ‘listen mate, you’ll have to keep an eye on me because everything’s in straight lines and very neat…if I slip out of it, just tell me’. This liaison was working with the camera operator, but I don’t think it ever happened, it was all fine. GF: It sounds like the character from the outset was a real acting challenge and then you get this extra layer added to it. Was he a challenge to begin with, just the normal Walter? JN: He was a joyful challenge. After I got the role I did a lot of research into all aspects of that type of character so I pretty well understood what was going on, including a lot of the science. I had a deal going with the writers. I’d do anything, seriously – I’d do anything as long as it’s not bad science. If it’s something that doesn’t make sense, something that a year 10 wouldn’t do, then don’t give it to me. If it’s feasible, no problem, but if it’s not I’ll have real troubles. It’s a good understanding. Generally, beyond a few things in the first season, everything we talked about was feasible in theoretical physics. GF: I’ll have to take your word for it. I don’t know science. You’ve gone from one mad scientist role to a very different mad scientist role, playing one of Batman’s great enemies, The Scarecrow. Do you see Walter and Scarecrow as having any common ground? JN: I think they’d get on fine! I think Walter would like Scarecrow and I think Scarecrow would have a soft spot for Walter as well. They’d be good allies! 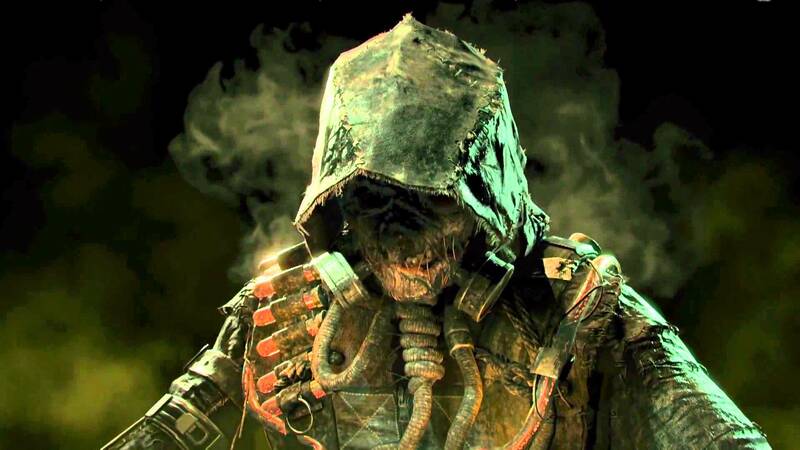 Ready to give Batman the heebie-jeebies in ‘Arkham Knight’. GF: I want to see that now! JN: Most of the characters I’ve played would get on well. That’ll be a very interesting enclave of crazy guys working together. GF: Could they accomplish anything though? JN: Certainly. They might have a few leadership issues, I think. I don’t think any of them would like to be followers, they’d all want to be leaders. It’ll be a strange democracy. Maybe they’ll just drug the rest of them to get their way. That’s what Walter would so anyway. JN: Just drug them up. Put them on the toxic gas or shoot them up with the LSD, that’ll be no problems. GF: This’ll be the greatest film ever made. JN: We can throw in Henry from Sleepy Hollow and even Morland from the latest show I’m doing (Elementry) together. JN: Dose them up. Drug of choice. That’ll be the way to go. I can see this happening. GF: Scarecrow was voice performance role, how do you go about creating a voice for a character who’s so well defined like that? JN: Well, it was a long time. From the beginning of development when I came in to do my first bits to when we finally put a lid on it…and even then the developers wanted to do more and more. Eventually they said they had to stop, please, let us release this game. They’d just play back what I’d done before and then we’d move on from there. And you work an awful lot with guidance, specific guidance from your producer on the other side of the fence. I’m quite happy with voice work, I don’t get at all precious about getting a line reading. You get actors, they all want to give you a line reading. Give me a line reading and I’m happy with that. Then it’s just hard work. You go into the studio for about six hours a day, which is a bit heavy on the voice. My pattern is a very simple one. They’d call a line, might be a paragraph and then just line 72, and I just do a little read through for myself, then do that three times back to back. No breaks, just three times back to back. At the end of that they’d be enough variation, almost always, for them to say ‘got it’. Or if they say, ‘no, no, we actually want you to do this’, then you go back and do it three more times. Ultimately it’s a very efficient operation. It’s not directed line to line as much as you may think. GF: Efficient over two years? JN: It was off and on. I’d go and then I’d come back 6 months later, that sort of thing. Once you’ve delivered a pattern of working, and as professional voice actors you do that, it’s kind of a routine. It’s not as edgy, you’re not as panicked about the director giving you every line, you just go ahead and do it. You own the character and provided you don’t lose your articulation or stuff it up – and that happens sometimes. JN: Even so, if you’ve hit a point you don’t even think about it. You just go back and do it again because it’s all digital now, they’re nobody wasting tape on it. It’s kind of relaxed when you know what you’re doing. JN: Absolutely one of my best known roles. GF: Denethor and Walter are both extreme personalities in different ways. How do you create a character who is that extreme without making them cartoonish? In ‘Lord of the Rings: Return of the King’. JN: Well, you see, I don’t set out to create any type of character. I look at what I’m given, what I know, what I work out about this particular animal that I’m playing and then it becomes a matter of truths. It’s not matter of ‘I need to be this sort of character’ at all. I don’t ever play that, in the same way I never try to be funny. That’s just disastrous. Just do what the character does. If you do what the character does and follow their impulses, not yours, their impulses, then you might turn out to be a villain, you might turn out to be very funny but you’re not trying to be either. I think the biggest mistake you could make is ‘I am playing the villain’, unless you’re doing a melodrama. Except we don’t make melodramas any more. JN: It could be fun. GF: Denethor could have been in a melodrama. GF: …how to eat cherry tomatoes. JN: That was perhaps the hardest part. It was a wonderful accident actually. Peter Jackson was watching me do my rehearsals by myself. Normally in these situations there’d be multiple takes and one of the actors jobs is to have continuity. So I’m sitting there thinking, ‘ok…with this food I’m going to go 1, 2, 3, 4, 5…1, 2, 3, 4, 5…’, so I could repeat it, the timing would be perfect. Jackson must’ve been watching through the monitors and he saw me squirt something out of the side of my mouth. He got terribly excited! He ran on to the set and said, ‘mate, what you just did there?” ” What was that, mate?” “When you squirted…can you do that?’ I said ‘yes’. ‘Can you go like hmff?’ I go, ‘yes’. He got terribly excited and waddled away again. That’s how that actually came about, because he was watching me rehearse to try and get my continuity right. GF: It became such a defining image for the character. JN: Defining image, yes. The eating itself was that…an obsessive man who was at a very low point of his life. He’d basically just sent his own son to certain death, or he’s about to…well, we won’t go into the psychology of that, but incredibly obsessive. You’d have to be to eat that way to be in the state he was. Incredibly obsessive and that’s what that was – obsessive eating. That’s sad. Again, if you’re looking at where the character would be at that point, that’s what you do. That’s what he did. GF: That’s brilliant. That’s really good insight. We’ve spoken about Walter and Scarecrow and Denethor, very well known roles…do you have a role or a part that you wish people were more aware of? JN: I generally get to play fairly interesting characters. For those who happened to catch them I was on The Good Wife, I just did a year on Elementary and the first season of Sleepy Hollow, I like a lot. I like working on that. I’ve done 24 over the years. And eons of stage work, I’ve done masses of stage work that no-one will ever see. Some of those are very special memories. Probably the only one, I did a kids show (Pirate Islands: The Lost Treasures of Fiji), a television series, where I played Blackheart the Pirate. That was the best fun I ever had in my life! Blackheart! We filmed it in Fiji with my mate Dougal. It was hilarious but it disappeared somewhere. Oh, God, I loved doing that. Hates children…hated children, this fella. One eye and long fingernails, dirty old bugger he was. GF: That just sounds like fun. JN: It was, so much fun. It was great. I still remember that with great affection, doing that role. GF: It sounds like you’ve had a very exciting career. JN: I have. I’ve been lucky. I’ve been as lucky as hell. I’ve had some ups and downs but not to many. I’ve been lucky, and had some great roles. GF: Look, thanks for coming down to Perth and talking to us. It’s been an absolute thrill. JN: Thank you so much, lovely to be here! Great actor, he made Fringe.